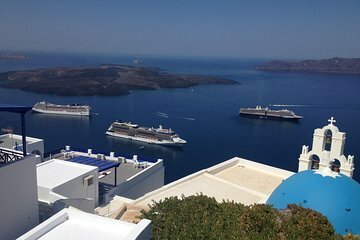 Get under the skin of Santorini on a private day trip, and experience its prettiest places and historical must-sees. As your guide chauffeurs you by comfortable, air-conditioned minivan, learn about the island’s history and culture, and explore the Minoan-era ruins at Akrotiri, the old capital of Pyrgos and Red Beach. Enjoy an optional lunch (own expense), check out the mountaintop Prophet Ilias monastery, and visit a winery to taste delicious Santorinian wines. Conclude at the cliffside village of Oia to enjoy its jaw-dropping views over the caldera.